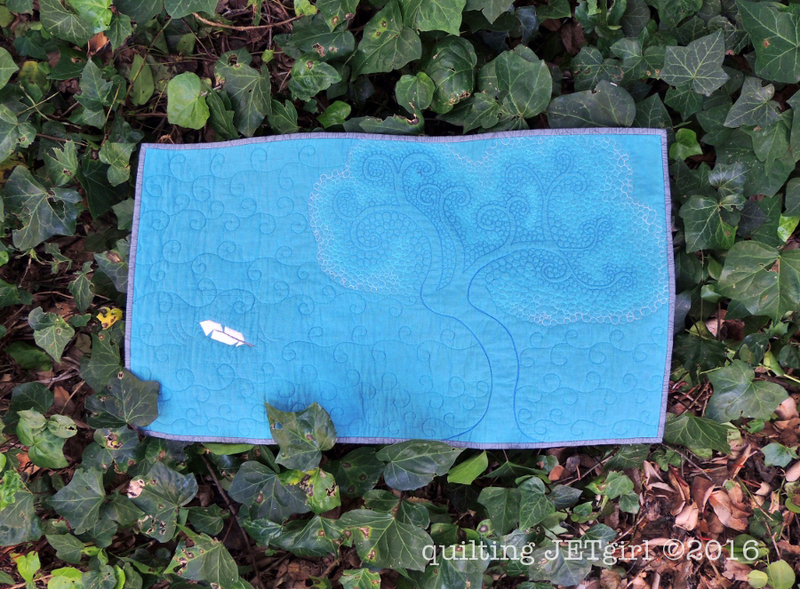 One year ago on my blog (on January 4th, 2016 to be exact) I announced I had created a Quilting Jetgirl Patreon account as a way to get some support to help me reach some goals I had for my blog and Quilting Jetgirl business. I was able to get enough support to quickly meet my main two goals: migrate my blog to wordpress.org and start physically printing my patterns. Thank you so much to everyone for their support – those who commission quilts or buy my patterns or have joined Patreon or comment on my blog posts or follow my journey or send emails. It is all deeply appreciated. I was thinking something organic. Curves or feathers floating in the breeze or tree branches in the wind or flight. Something with movement. That flows. I also would rather the quilt not be made completely of straight up solids unless the solids are more textural like grunge or shot cotton. I’d be super excited if there were a pebble or two or three somewhere in the quilting. I quickly pulled some options from my stash to work with, and I felt that some Turquoise Andover Chambray might fit as a textural solid. First of many #TeenyTinyFeather blocks for a #PatreonRewardMiniQuilt using Amanda @whatthebobbin's paper pieced pattern. Glad I got to sew something today! I also found a Teeny Tiny Feather (4″ finished) paper pieced block by Amanda of What the Bobbin on Craftsy and pieced a block quickly. Then I stalled. I had a feather, I had what I thought was *just* enough fabric as a background if I didn’t do too much more piecing, and I stalled on what to do next. Inspiration struck when I saw this beautiful quilting by Wendy Sheppard from Ivory Spring in my Instagram feed. I decided to go ahead and piece the lone feather in a sea of background fabric and to quilt an organic tree in all the negative space. I wasn’t feeling especially confident in just “winging” quilting something so detailed, so I scoured images on the internet and found a very organic, flowing, and quilting motif (swirls!) 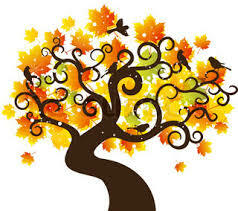 tree graphic from which I based the trunk and branches for the mini quilt. The only thing left to do was to trace out the shape on the quilt, take a deep breath, and start quilting. 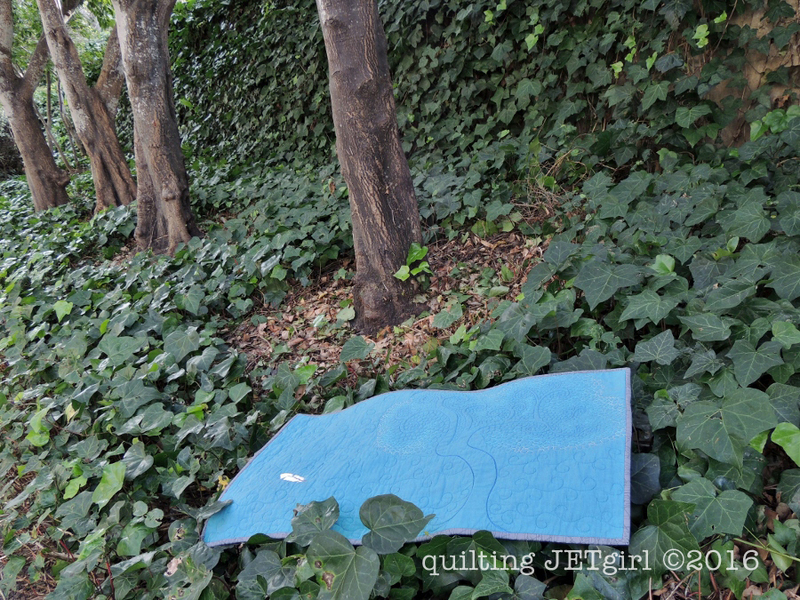 I used 5 different shades of blue/teal/turquoise 50wt Aurifil threads to quilt the tree trunk and its pebbles/leaves. The trunk of the tree is 2735 (Medium Blue), and the pebbles closest to the branches fade from 1125 (Medium Teal) to 5005 (Bright Turquoise) to 5006 (Light Turquoise) to 2309 (Silver White). I outlined the feather using 2309 and added a few “motion” lines to help give the sense that the feather is floating down in the breeze. The background quilting is loose back and forth swirls in 1125 to give a sense of wind blowing. I shared progress on creating this mini quilt on my Instagram account and also asked for a bit of help in what to name the quilt. The name “The Giving Tree” popped up quickly and I felt it was appropriate for so many reasons. I am so thankful for the support this patron has offered me, and her grace in allowing me to take my time in creating and sending this mini quilt to her. I also love the connection to one of my favorite childhood books by Shel Silverstein. 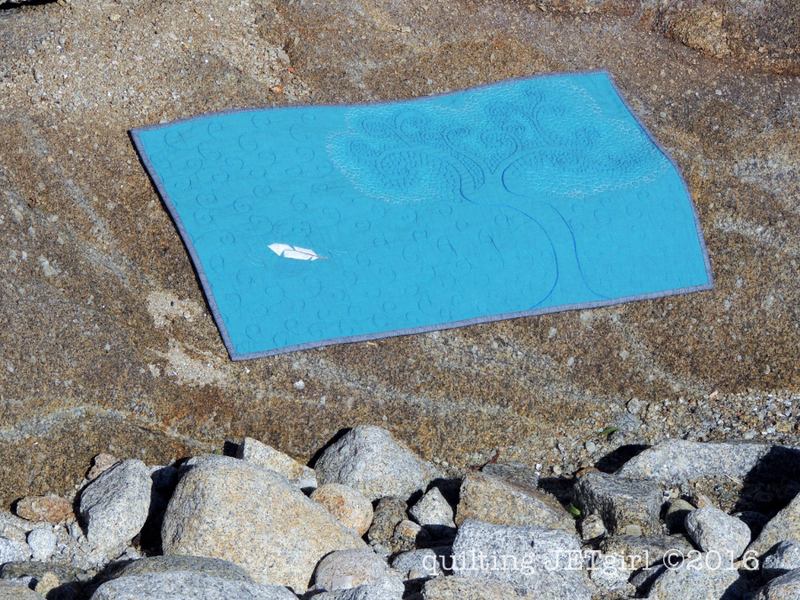 I took “The Giving Tree” mini quilt with me to Monterey, California, over the holiday break and found many beautiful locations to photograph it as my husband I walked nearly 30 miles along the coast over two and a half days. The mini quilt finished at 30-inches wide by 17-inches high, and I added a hanging sleeve to the back to help it hang nicely in its forever home. Creating this mini quilt has ignited an urge to create more whole cloth quilts in the upcoming year. I don’t know if that is something I will realistically be able to achieve, but it is definitely something I want to explore. 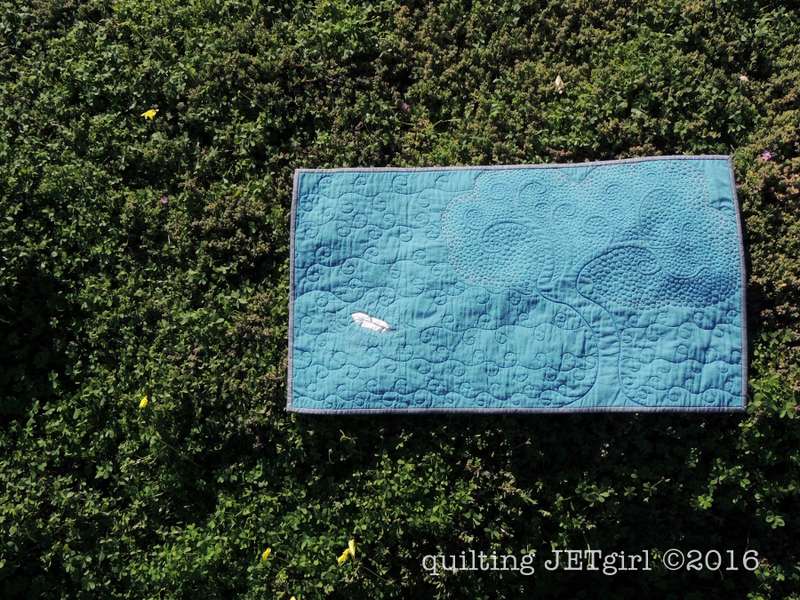 If you would like to sign up to support me via Patreon, please visit the Quilting Jetgirl Patreon page for the full details. At each level of pledged support ($1/month, $3/month, and $5/month), there are rewards and I have a new quilting pattern ready to send to supporters who sign up or continue with me for another year in early February! This is beautifully done! Your design and execution seem spot on to me. Lovely! I fell in love when I first saw it and more so now! Beautiful and amazing! You are so good with whole cloth designs and ideas. Can’t wait to see more from you! Yvonne, I love this quilt so much!!! I didn’t realize how small the feather was until I saw it in the finished quilt. I love the way it is floating through the air, and the quilting of the tree is fantastic. Thanks for sharing the kitty mini, the quilting on that is wonderful as well. The mini you made is so incredible! I love the little feather and I love your FMQ, just everything! The whole concept is amazing. And I really loved hearing about your process, especially your ability to sit back and let the ideas come to you. As always, thank you so much for sharing. 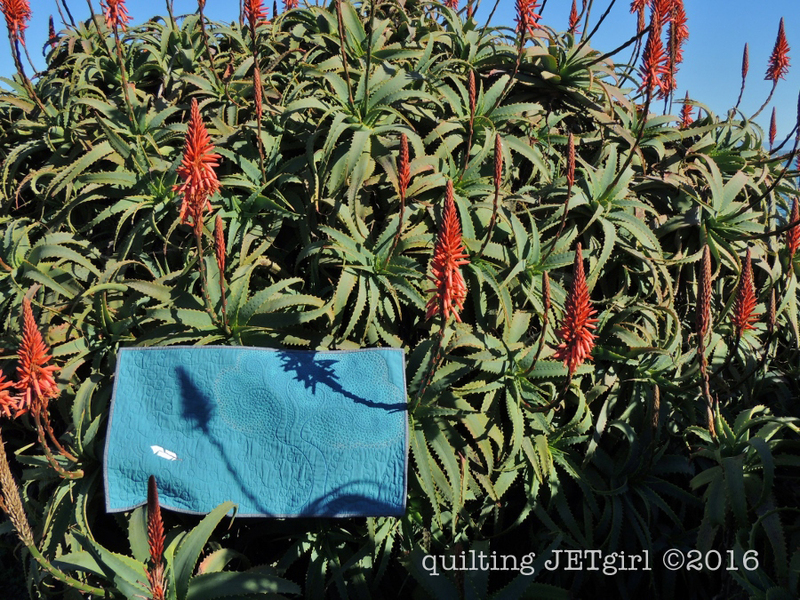 I love this mini quilt and the tiny feather. The FMQing is beautiful and brings the whole piece to life. Such a beautiful mini and I just love the process story behind it. Shel Silverstein was one of my favorites growing up and I can still quote many of the poems by heart from Where the Sidewalk Ends (my copy from grade school sits on son’s bookshelf in his room, right next to The Giving Tree). Thanks for sharing this quilt’s story. The quilting on that tree is really so pretty! I enjoyed all the detailed pics on IG. Wow! This is amazing, Yvonne! The teeny little feather is such a great detail and seems to bring the whole quilt to life. The quilting on the tree is phenomenal, especially with all those pebbles. It turned out so lovely. I really like the last picture. It really gives the impression of a floating feather. From such a simple idea to a beautiful finish. Gorgeous mini! Wow! What a beautiful quilt Yvonne! That tree image is one of my favourites and you’ve created it beautifully with your FMQ! This is really so so beautiful. The feather is so teeny yet simultaneously the whole being of the quilt. It really is a proof of that saying “less is more”. And as always your locations are the perfect setting. It’s amazing. You rocked the quilting. I’m sure it will be appreciated and well loved. I love the way the tree turned out! Especially the use of different threads to create all those pebbles! Did you stitch around the feather, or is it floating? Did the quilt pucker around the tree with the denser quilting?